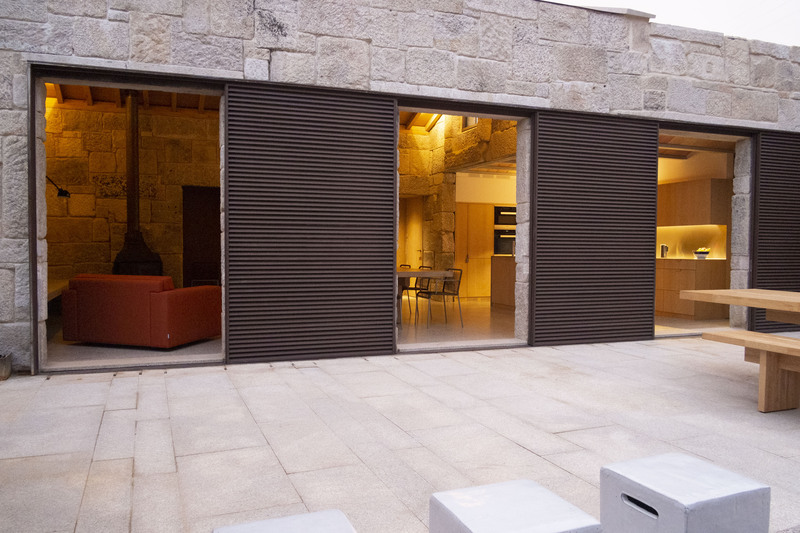 Upon entering, the first space that you encounter is a spacious outdoor courtyard, a contained room open to the sky. This is our outdoor living room where we spend most of our day. 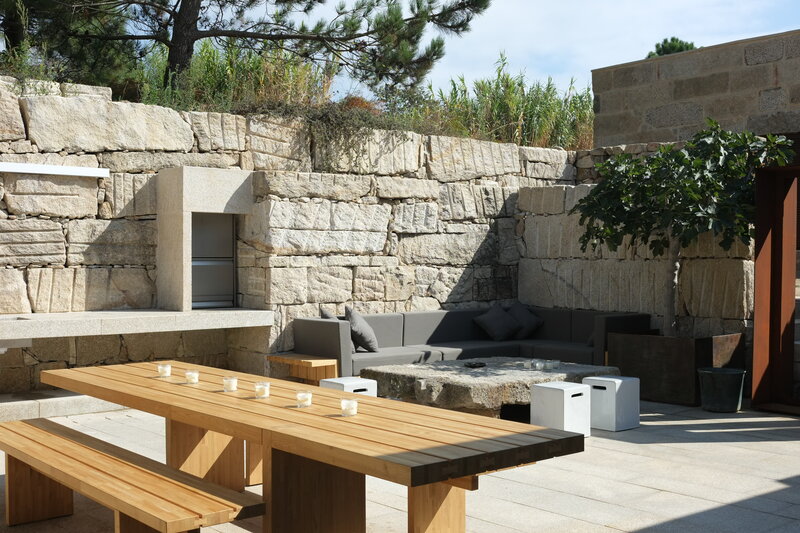 It has large timber table for 12 people, a long granite counter with sink, charcoal BBQ and a gas plancha and a comfortable seating area under a fig tree. 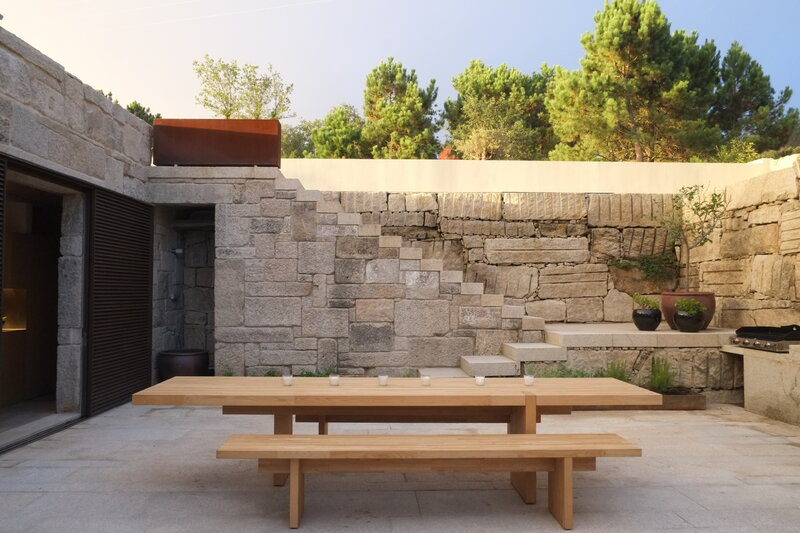 From the courtyard, three openings in the house open into a lofty living room with a dining area and an open kitchen. 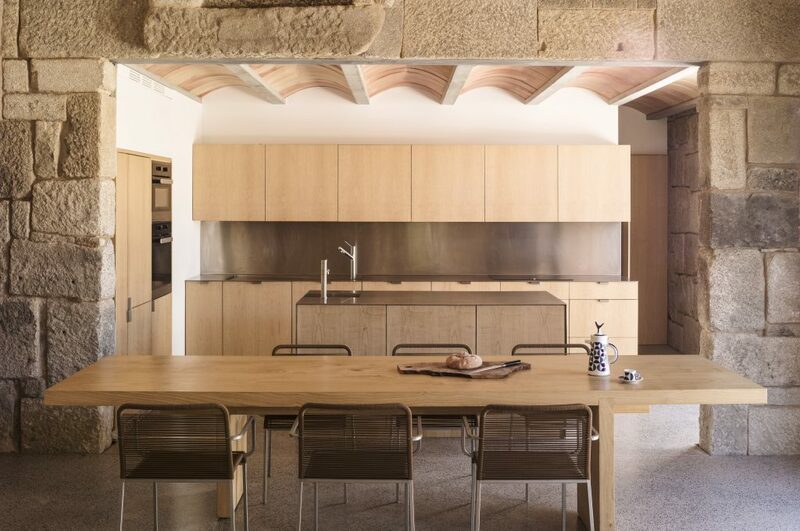 Double height with a exposed stone walls, solid chestnut ceiling and a wood-burning stove this is the heart of the house and the indoor counterpart of the courtyard. On the same level are three double bedrooms, each with a shower room, two of which are ensuite. Upstairs is a large bedroom with distant views toward the sea on one side and a door opening to the pool terrace on the other. This room includes an office area and another shower room. In the courtyard, a wide stone staircase leading up to the upper terraces feels ancient, a part of the rocky landscape. 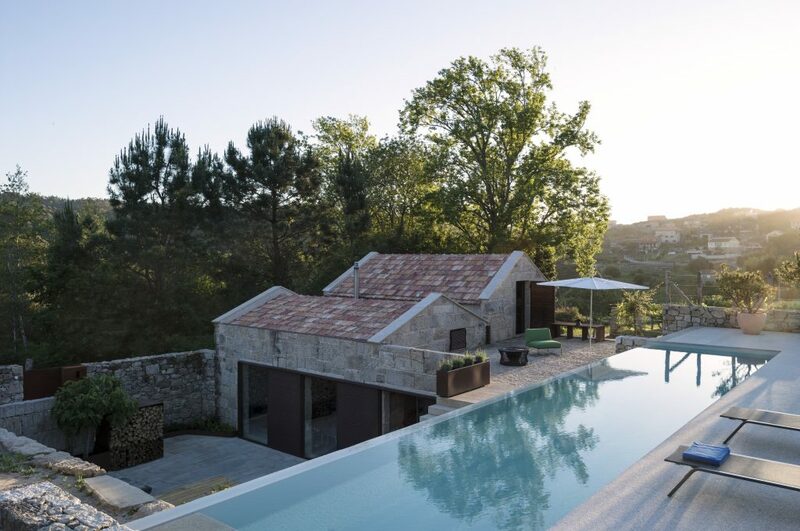 A 15m infinity pool overflows down one wall of the courtyard below. 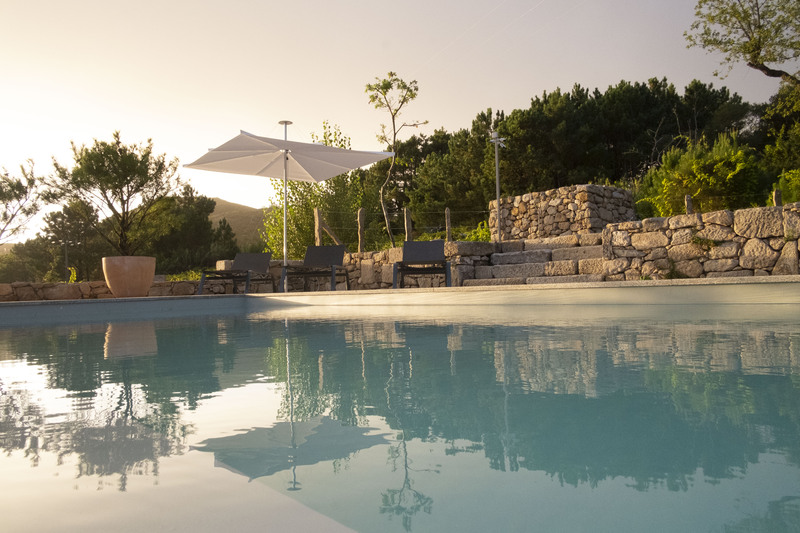 In the garden beyond, existing pines have been shaped to create a natural parasol, complemented by an olive tree, local cork oaks, chestnut trees, fig trees and Mediterranean herbs and wild flowers. There are four large umbrellas that can be moved around the courtyard and the pool terrace. The Cabana, across a footpath from the main house, has room for an extra four people. The two houses are independent and can be rented together or separately. From June to September, we rent the house from Saturday to Saturday. Arrival time is from 4pm, and departure by 10 am. 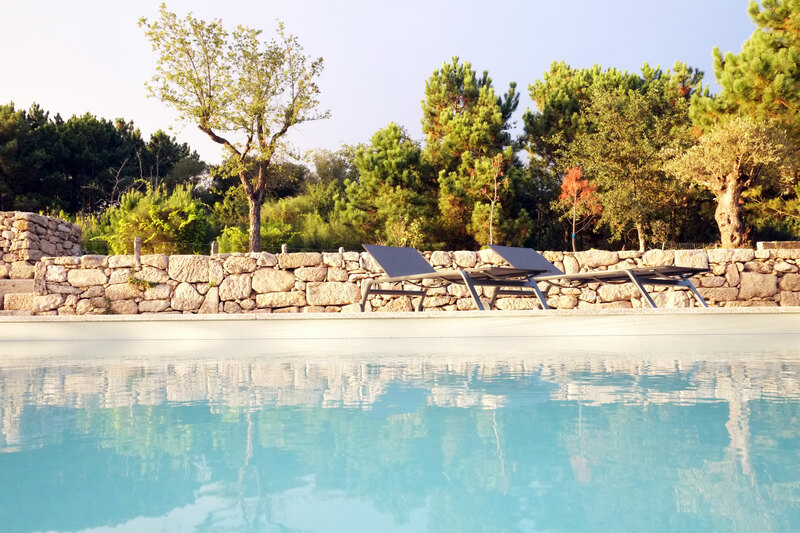 At other times the minimum rental period is three nights. The main house can accommodate 8 people in four bedrooms. Two bedrooms have a double bed and the other two bedrooms can be each arranged as a double bed or two twin beds. 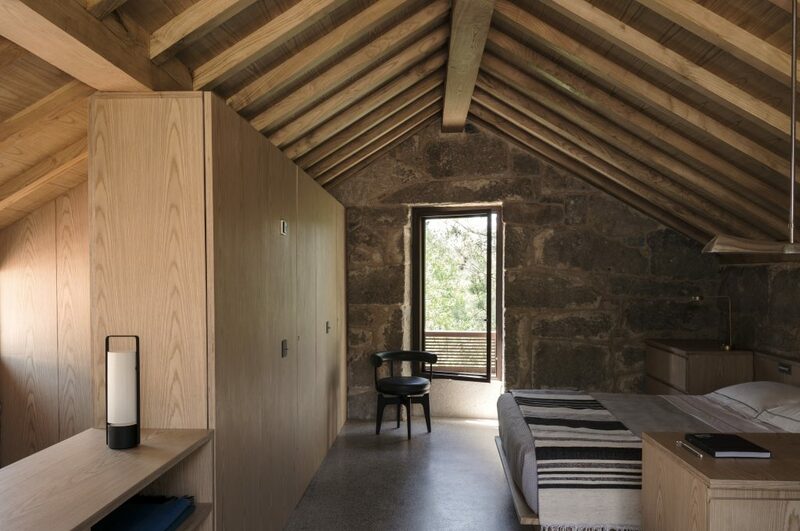 If you need more bedrooms, you can also rent the small house which sleeps four. The house was designed with summer in mind. It stays cool when it is hot at midday and the courtyard reflects the heat back at night so it is always comfortable. 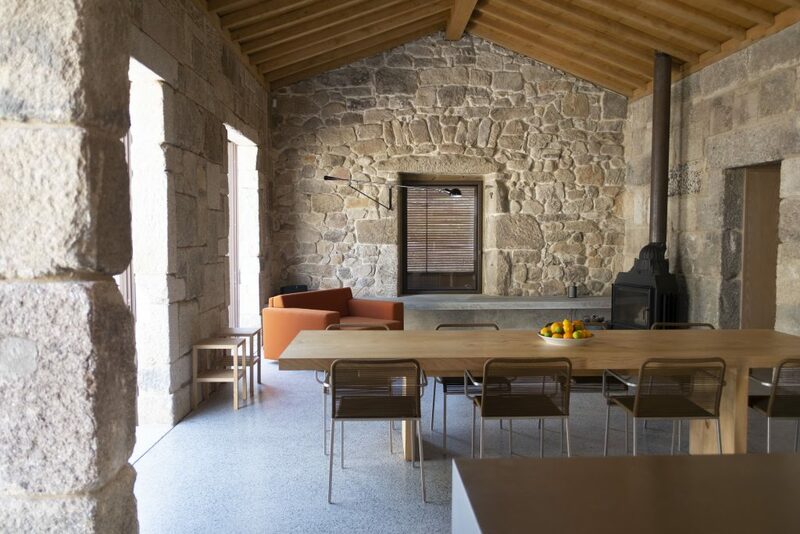 The house has a polished concrete floor with underfloor heating and a very effective wood stove in the living room. Although it is suitable for winter stays, the walls are not insulated and the bedrooms do not get very warm in the middle of the winter. The pool is heated by solar panels. The temperature is very pleasant from early July to the middle of September, usually around 26 degrees, but it will be cool at other times. 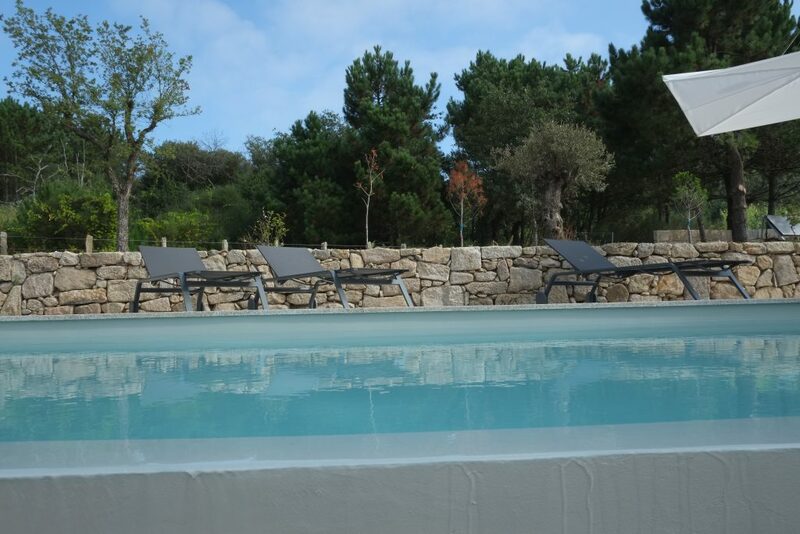 The pool is not useable from the end of October to Easter. The house has: two fridges, a freezer, two ovens including microwave, induction hobs, dishwasher, washer and dryer, table for 10-12 people, 4 shower rooms with toilets (three are ensuite and the fourth is adjacent to the bedroom), hairdryer and baby cot. Outside there is a kitchen counter with sink, charcoal BBQ, gas plancha and a table for 12 people. 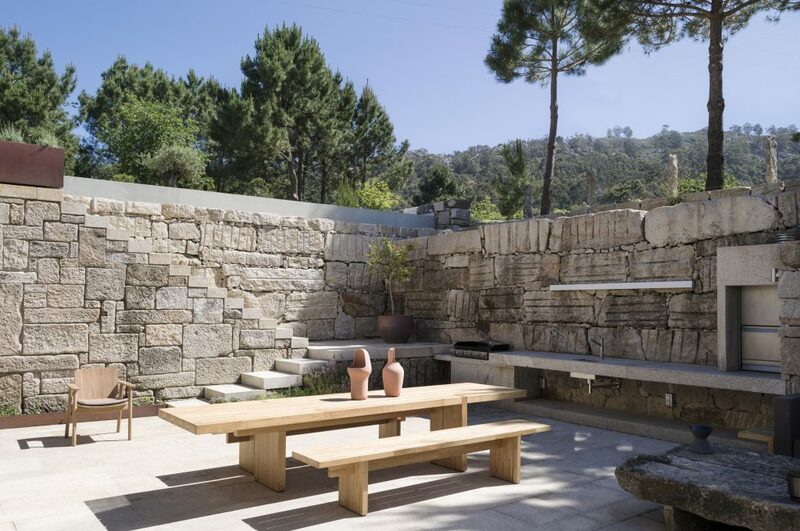 There are two outdoor showers, one in the entrance and one near the pool. There is no television but there is good Wi-Fi. There is a Sonos speaker to listen to your music via your electronic device. Mobile phone coverage in the whole area is poor because there are no antennas nearby due to the natural setting. The access to the house is along a narrow dirt road used by no one else. We are not allowed to pave the road due to environmental reasons, so it can be bumpy depending on the time of year. The advantage is that almost no one else drives down that road, so there is no traffic at all. For wheelchairs users, there are 4 steps down to get from the road to the courtyard At that level the house and courtyard are without any steps. However there are steps to go to the upper floor and the pool terrace. Overall, it is not an ideal environment for a wheelchair user.